Do you want to make People for the Ethical Treatment of Animals (PETA) mad? There are many good reasons to make PETA mad: The group wants to ban all human use of animals, from food production to pet ownership. The best reason is that the group hypocritically kills pets at its Virginia headquarters “animal shelter” by the hundreds, totaling nearly 35,000 since records began in 1998. Pointing out the fact that PETA kills a large proportion of the pets in its care — just under 74% in 2015, with a lifetime kill rate exceeding 86% — is also an effective way to get under the skin of the controversial animal liberation group. With that in mind, we’ve used the annual release of PETA’s state filings to highlight PETA’s gruesome practices with a mobile billboard outside PETA’s office in Washington, D.C. 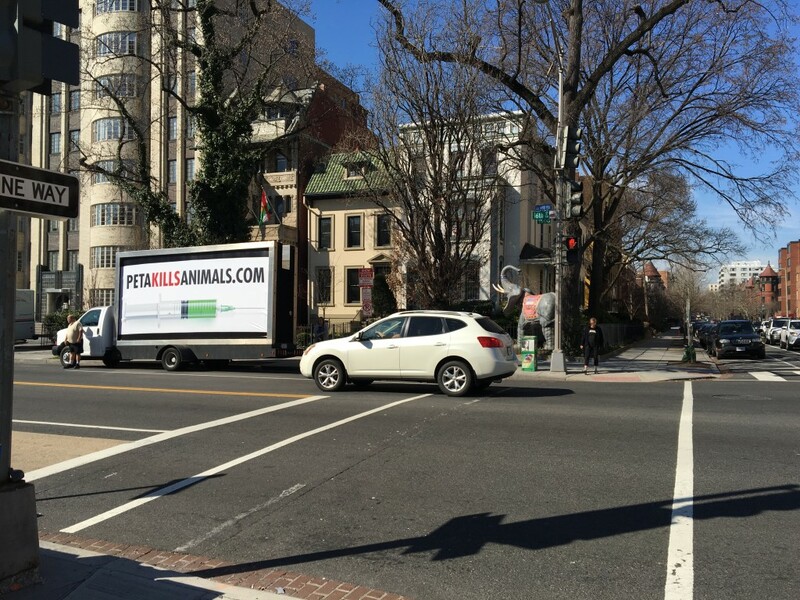 Apparently, the truth about what their Norfolk, Virginia colleagues are doing was bothersome enough to the PETA staff in Washington that they appeared to shut their blinds as our billboard parked in front of their headquarters. The problem is that PETA reports every year to the state of Virginia how many pets it kills. According to the most recent report, PETA killed 447 dogs—more than one every single day. So comparing questions about what dogs PETA kills (especially when PETA employees have snatched and killed at least one family’s pet) to a purely loaded question strikes us as protesting too much.